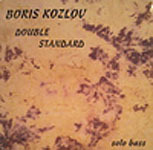 Two-time Grammy Award winning acoustic and electric bassist, composer and arranger, Boris Kozlov has been on New York and international jazz scene for the past 20 years. Currently serving as a Bassist, Arranger and Musical Director for Mingus Big Band, Mingus Dynasty and The Orchestra, as well as leading his own projects, he has also been a first-call bassist for such important jazz acts as Michael Brecker, John Blake, Ray Barretto's New World Spirit, Lew Tabackin, David Kikoski, Alex Sipiagin, Jean-Michel Pilc and many others. Boris Kozlov was born in Moscow ,USSR on December 5, 1967 . Having a chance to go to Children's Music School to study piano for 7 years, he fell in love with the bass and won Gnesin Music Academy competition to enter college at the age of 15 on electric bass guitar. While being influenced by rock and classical music, he took interest in jazz at 17 and went on to study acoustic bass with a notable bassist Anatoly Sobolev. Upon graduation in 1987 with Diploma of Honor at the age of 19, he served mandatory 2 years in the Soviet Army, where he had to play tuba and other brass instruments besides basses in the military band. Once out of the Army, he was hired by the State owned 'Melodia' Studio Ensemble in 1989 and proceeded to record more than 40 albums with them as well as many other Soviet jazz artists. At the same time he continued his studies at The State Academy of Music. At the First USSR Competition of Jazz Soloists in 1990 he won The Grand Prix as well as a special prize for his original composition. After winning the first spot in Young Musician category in USSR Jazz Journal in 1991 he moved to New York. The self-study continued in a specific NY jazz environment ,where he was eventually hired by Hassan Williams and Terry Gibbs/Buddy De Franco Band and later by saxophonists Bobby Watson, Bob Berg , Benny Golson, James Moody, Ronnie Cuber, John Stubblefield, Ravi Coltrane, Seamus Blake, Donny McCaslin; trumpeters Dizzy Reese, Phillip Harper, Brian Lynch ( Grammy 2007), Alex Sipiagin,Ray Vega pianists Eddie Palmieri, Walter Bishop Jr., Michel Petrucciani, Arturo O'Farrill, Michel Legrand, Stanley Cowell, Jon Ballantyne, George Colligan, Orrin Evans, Edward Simon, Helen Sung, Joey Calderazzo; vibraphonists Joe Locke, Bill Ware; guitarists Mark Whitfield, David Gilmore, Adam Rogers, Jack Wilkins, Ximo Tebar drummers Tommy Campbell, Victor Jones, Marlon Simon, Victor Lewis, Jonathan Blake, Jeff 'Tain' Watts, Ali Jackson, Antonio Sanches; vocalists Jay Mc Govern, Urszula Dudziak, Monday Michiru; trombonists Conrad Herwig, Robin Eubanks, Andy Hunter; trombonist/vocalist Frank Lacy’s Experience and the funk-jazz band NewHypeJazz . After sharing a stage with McCoy Tyner, Jimmy Cobb, Maceo Parker, Jimmy Smith, Henry Butler, Toots Thielemans & Clark Terry on multiple occasions and playing on 9 Grammy nominated albums plus the Grammy winning 'Simpatico' -in addition to the other 160 albums, having few of his Scores published, Boris continues to serve as an MD for all of the Mingus Dynasty projects( winning his 2nd Grammy with them in 2010) ,touring and recording extensively with multitude of different other bands ,as well as doing international work with his own Malfunction Alibi. He also performs solo bass and teaches master classes around the world following the release of his acoustic solo album  Double Standard. All About Jazz musician pages are maintained by musicians, publicists and trusted members like you. Interested? Tell us why you would like to improve the Boris Kozlov musician page.